Foam is one of my favourites. There is something just a little unruly about it, as if its foamness can never be fully constrained. Hence the need to truss it up like a turkey, tear it into smaller pieces or squeeze it into boxes or containers in case its foamacity spills out all over the place. Whatever happens, foam must never be left to simply be. I wonder if, in part, this is a response to our subliminal awareness that foam simply takes up too much space, that there is too much of it, and that what there is of it is simply dead space. It’s not doing anything. It’s just taking up room, interjecting itself between other objects, moulding itself to whatever is imprinted upon it – malleable, accommodating, even welcoming but nevertheless, in a benign kind of way, perfectly utterly useless. Foam is a silent indictment of mankind and our desperate need for comfort and support. It’s hard to believe that any other animal would have bothered to invent foam, would even have been able to conceptualise the need for foam. They – these other non-foam-addicted animals – simply adjust to their environment as required, making the best of the conditions as they occur. Man, on the other hand, must have foam. Must make foam. Clever, clever man. Of course, I’m not denying that foam has many handy applications – cushioning, silencing, protecting etc. These are all very worthwhile things to do but it doesn’t alter the fact that, at the heart of it, what all this foamultitudiousnesss boils down to is simply our ability to trap air. That’s the gist of it. Trapping air. We are gods. So, yes, let us excuse a little shamefacedness about the foam, an embarrassment perhaps that we have foam. Tie it up tightly, rip it, make it seem smaller than it really is (release the air!) 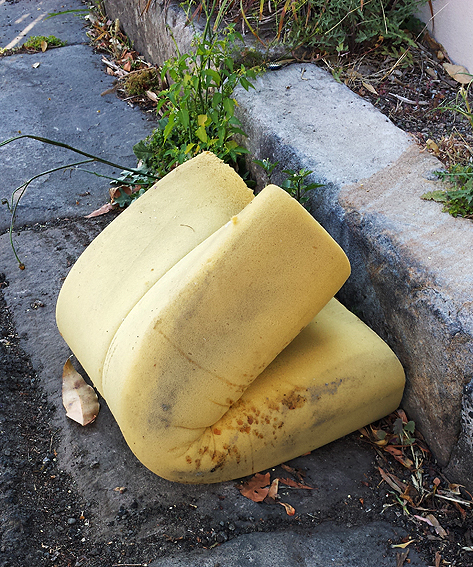 and then perhaps our love of – our need for – foam won’t appear quite so blatant after all.